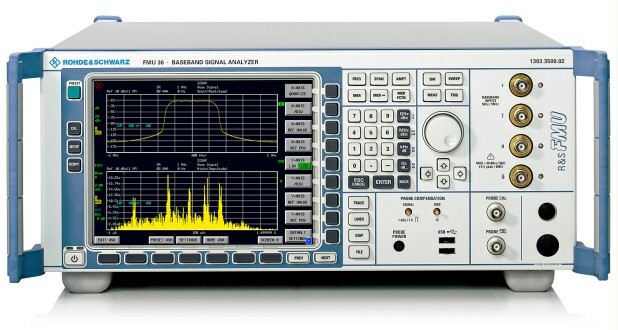 The R&S®FMU36 is an all-purpose analyzer for analog and digital baseband signals. Moreover, the FFT-based structure enables users to analyze extremely weak signals at low frequencies where analyzers with superheterodyne structure exhibit lower sensitivity. 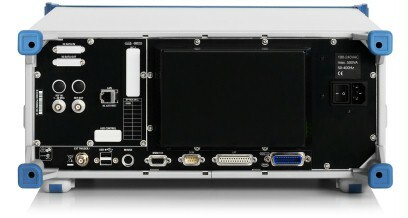 Measurement functions for TOI, MC ACP(R), OBW, CCDF, APD, etc. Measurement applications for cellular standards, wireless connectivity standards and general purpose, e.g. phase noise, noise figure, etc. In today’s wireless communications systems, more and more of the transmitter and receiver functionality is performed in the baseband. This is true for mobile radios, as well as for base stations. With the R&S®FMU36, you can easily analyze these signals going in or out of the baseband. This, for example, makes it possible for baseband designers to test the modulation quality of a signal immediately after it leaves the baseband. 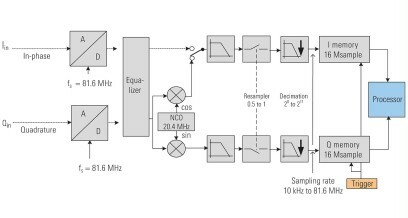 A receiver designer can verify the quality of the signal before it enters the baseband. The R&S®FMU36 has two analog inputs. They can be operated either as single ended or balanced. The impedance can be set to either 50 Ω or 1 MΩ to match the impedance of the DUT. For users who want to use probes to connect to their DUT, the R&S®FMU36 provides a calibration source so that the influence of the probes on the measurement results can be minimized. The R&S®FMU36 provides all the functionality you expect from a Rohde & Schwarz analyzer. To measure frequency selectively, the measurements in the time domain can provide very useful information, for example on a weak pulsed signal close to a strong signal. With the R&S®FMU36, the pulsed signal can be filtered out and the pulse duration and power can easily be measured. This is a functionality that a traditional FFT analyzer lacks. With the R&S®FMU36, the center frequency and resolution bandwidth can be set independently. With a time-capture memory of 16 Msample on I and Q, the R&S®FMU36 can capture long sequences. Before the signal is stored in the memory, it is resampled to optimize memory usage. With a WCDMA signal, 100 consecutive frames can be stored for later analysis. With a GSM signal, the memory can store more than 3500 frames. The data can then be analyzed either in the firmware or on external analysis tools after being exported. The memory can be extended in two steps to 235 Msample and 705 Msample, corresponding to more than 8.5 seconds at the maximum sampling rate of 81.6 MHz.